NeoHealth provides affordable, quality healthcare to everyone. We offer Family medicine, Pediatrics, Obstetrical and Gynecological (women’s health), and Pharmacy services. Our facilities are located in Adair, Cherokee, Mayes and Muskogee Counties; our patients come from over six surrounding counties. We are a non-profit organization lead by volunteering members of the patients we serve, whom comprise our Board of Directors. 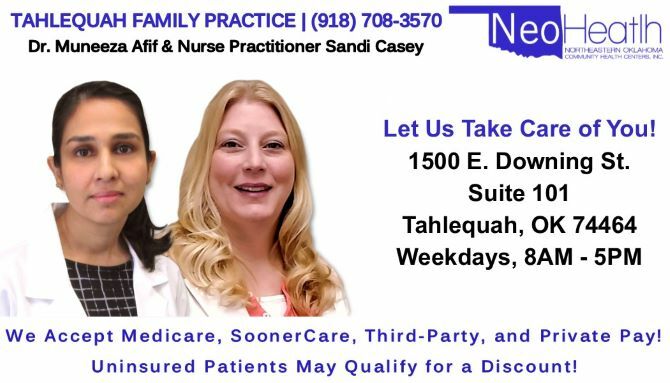 Northeastern Oklahoma Community Health Centers, Inc. (NeoHealth) is a community partner striving to provide primary health care to the residents of northeastern Oklahoma. Affordable primary health care - it's that simple. Community Health Centers were originally created fifty years ago to provide primary health care services to communities where there were few or no doctors. Today, Health centers are preferred healthcare providers. NeoHealth continues it’s commitment to advancing the standards for a healthy life in the communities we serve. The residents of rural communities should be able to expect and receive quality health care, and that's exactly what we strive to provide.